After taking Kickstarter by storm, the Pebble smartwatch went on to become a real product. Hey, that's more than you can say for some Kickstarter campaigns. The backers have had their devices for a while now, and the time has come for Pebble to expand. First stop: Best Buy. The Pebble is going to be exclusive to Best Buy, at least for the time being. You're probably aware, but the Pebble is a slick (kind of) smartwatch with an e-paper display. It pairs with Android and iOS devices over Bluetooth to enable notifications and remote control features. The jet black version will be in store on July 7th, and is already listed online. 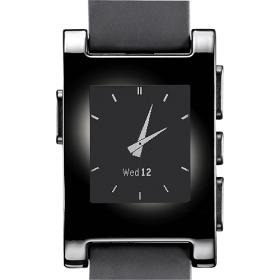 Pebble's press release says the black watch is available online now, but orders aren't going through as of yet. Check back throughout the day. It should start working at some point. 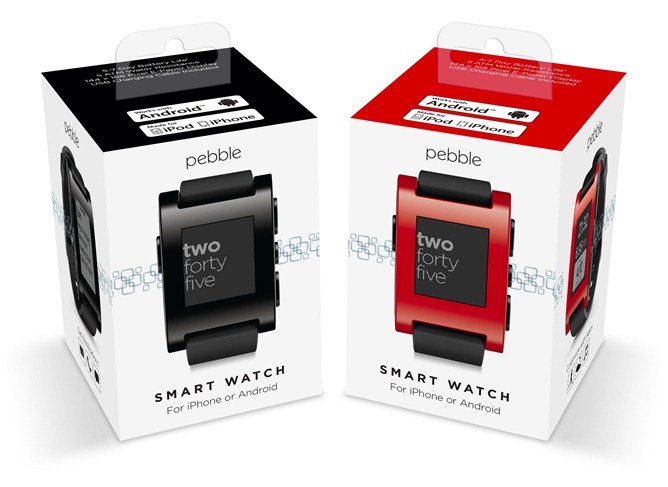 Backers got a good deal on the Pebble, too. Earl birds got it for $99, while late bloomers paid $115 (black only). The other colors were $125. The red Pebble will hit stores in August (also at $149.99), but the orange, grey, and white are still pre-order only on Pebble's site. Save your pennies, folks. Full PR below. Pebble is the innovative and customizable Bluetooth watch that seamlessly brings information from iOS and Android devices to your wrist. Pebble is Kickstarter's most successful crowdfunding project ever: earning more than $10.2 million from more than 68,000 backers. Pebble's exclusive retail launch partnership with Best Buy will help satisfy strong demand, expanding the user base for its app ecosystem. Pebble Technology proudly announces the exclusive launch of its record-breaking smart watch in Best Buy stores this summer. Jet Black versions of the programmable, waterproof, app-enabled smart watch are available online now at bestbuy.com/pebble and in all US Best Buy stores on Sunday, July 7 (MSRP $149.99). Pebble's expansion into retail distribution is a key step in meeting the tremendous public demand for its crowd-supported e-paper watch for iOS and Android. Pebble's black-and-white e-paper display is sharp and clear, with animated graphics that are fully readable in bright daylight. The watch pairs with iOS and Android devices via Bluetooth, allowing for wrist-top notifications like text messages, emails, and incoming calls as well as remote control features for music and other media playing from the phone. Pebble's watch band is fully customizable as well, compatible with any standard 22mm strap. While offering a full-featured out-of-box experience, Pebble also gives those who are eager to build and tinker the tools they need to expand the watch's usability. Pebble's evolving, open development platform allows people to create and share watch apps -- from custom watchfaces and stopwatches to fitness trackers and games -- making a wide range of designs and utilities available for all. Pebble users can also enjoy existing integrations with popular sports apps RunKeeper and FreeCaddie, with more apps to come in the future. Jet Black Pebbles are available now on bestbuy.com/pebble and in stores on July 7, with Cherry Red Pebbles to follow in August. Pebble's three other colors -- Orange, Grey, and Arctic White -- remain available for pre-order on getpebble.com.